A new $46 million complex, mostly paid for by billionaire Paul Allen, will house 94 families in South Seattle. Allen’s is the largest donation ever for a single housing or homelessness project in Washington, according to Bill Rumpf, president of Mercy Housing, which will run the complex with partner agencies, including Mary’s Place and the Refugee Women’s Alliance. 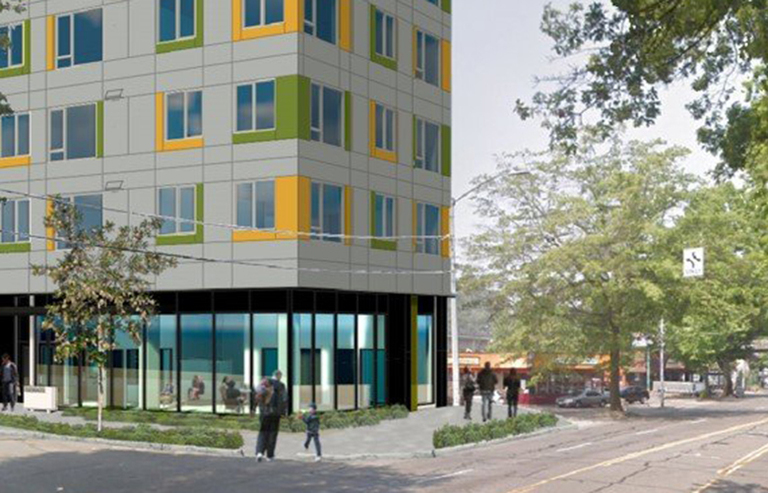 Seattle Mayor Jenny Durkan, whose Office of Housing will kick in $5 million, will be at the groundbreaking ceremony Tuesday for the 8-story building a block away from the Mt. Baker Link light rail stop. Another $10.7 million for the project came from a housing tax credit. Family homelessness has become an issue of importance for philanthropic Seattleites and corporations. Amazon founder Jeff Bezos announced last week that he would be spending $2 billion on helping homeless families, as well as creating a network of nonprofit preschools in poor communities. The eight-story project will sit a block away from the Mount Baker Link light-rail stop. Half of the units are reserved for homeless families — some for long-term stays, some for shorter-term, “move-on” stays. The other half will be for families making low wages, from $27,100 to $54,150 annually for a family of three, according to Rumpf. Operating costs are not covered by Allen’s donation. Mercy Housing will be seeking public and private funding to help defray the cost of running the facility, Rumpf said, with a promise by the city that it would provide or help secure the operating and service money. The bottom floor of the complex will be a day resource center for families, where anyone can access services intended to divert people from homelessness, get help finding child care and attend after-school programs. But they don’t just want homeless families walking through the door, according to Pearl Leung, external affairs director at Vulcan, Inc., Paul Allen’s development company. As part of the planning for the project, Mercy staff interviewed 45 formerly homeless families, and one of the things the team heard was that homeless families don’t want to feel quarantined away from the neighborhood. Mercy Housing is hoping to draw in families from Beacon Hill and South Seattle with play groups. “The dream for this is that families in the area just see this as a resource center for families,” Leung said.